COMMENTARY ON "THE WRATH OF ELIHU"
Today’s lesson is a good read and the author makes some valuable points. I would recommend that the reader go through Job, particularly reading the arguments put forth by Eliphaz, Bildad, and Zophar. Notice that they rely on a God that is not sovereign and they try to explain Job’s condition with this presupposition. Also their perspective is limited by the science and philosophy of the day. This should be a good lesson to all of us. Remember that just as these men lived in a bubble of their day so do we. In time our feeble reasoning will appear just as silly as theirs does. This is why, though science and philosophy have value, they should be used in a ministerial sense rather than a magisterial one. What do I mean by that? When I say magisterial I mean using reason in such a way that you bend the Word of God to your understanding. When I say ministerial I mean using reason as a means to explain what we don’t understand but still submitting to scripture when our reason can’t grasp it. It is my observation that every Christian tradition and individual struggles with this tension to one degree or another. So it is good for us to learn from this example. I would recommend that the reader first read Job 40:6 through to chapter 42. In this passage you will see God declaring his awesome might and power. To which Job is speachless. We should also stand in humble submission to God as Job does in the end (below). Todays lesson does quite well in pointing out the failed reasoning of Job and his friends who are trying to comfort him. Good advice to the reader is to pay close attention to when people quote Job out of context. It is very easy to take a passage from Job or one of his friends in their discourse to mislead people. These chapters are men basically exchanging false ideas and false doctrine. That’s the context, so it should not be taught as truth. In this case I like that the author of todays lesson points this out and then draws parallels to us today when we do the same. The mistake that the author makes is that he pits Job against Elihu when in truth they are both making the same error. Both of these men to a greater or lesser extent are not understanding the sovereignty of God as taught in scripture. Instead they are looking to themselves for the answer. In Job’s case he justifies himself by not deserving this punishment, and Elihu instead blames Job. Both of these erroneous assumptions place man as the solution and God as the problem. Rather than point this out the author has to rely on his arminian based theology and end up picking a side with Job or Elihu rather than reject them both in the passage being examined. Job gets misunderstood by a lot of scholars today. We think it is about a bet between the devil and God. The events that play out in the heavenly court in the first chapter are really just a side show. The thesis of this book is the power and sovereignty of God. Notice by the end of the Book the devil is not relevant enough to even bring up and man has been silenced. The chain of events leading up to his sufferings is never even explained to Job. Quite frankly, just like us he isn’t owed an explanation. Like Job we should repent in dust and ashes for blaspheming the power of God in our lives just like the sophistry of Job’s friends. The error that Job and his friends are making is that they are assuming that Job had control over what was happening to him to one degree or another. For example, if Job had behaved better then it wouldn’t have befallen him, or rather since Job is good then how does this chain of events not prove God is evil? People struggle with this today. Ultimately the question is why does God let bad things happen to good people? There are many problems with this, one is that all are guilty and deserving of God’s current and eternal judgement. What you have playing out in the book of Job is law and gospel. Job is blameless in the eyes of God because of Christ, justified in faith. However in the flesh he is also damned in sin and death and deserving of every punishment. God doesn’t owe him any excuses, and none of this has to make sense to Job or his friends while it is playing out. Even when bad things happen in this life it is because of sin. God has allowed this by his sovereign decree to play its course. Like Job does at the end of the book, we should realize this and repent in dust and ashes. Todays lesson fails to address some obvious holes the argumentation being presented by Ellen White. One cannot simply write off the origin of sin as a mystery. Conceding that we do not understand something or that the Bible hasn’t spoken clearly on a particular doctrine is one thing. But deliberate ignorance is another. So it stands to reason he knew evil would be a thing before he created anyone in the first place. This isn’t vain philosophy it’s just plain reason. You have to say that God has allowed for evil to be a thing with full knowledge that it would be a thing before he created anything. You can’t even say he tried to stop it either, he could have simply placed the tree in an obscure location Adam and Eve would have never found if he wanted to. But he didn’t. Generally the problem one brings to the table in these discussions is failing to define terms Biblically. The Bible defines God as being Good (Ps. 136:1). Therefore, allowing evil to come into being and exist for a specified period of time as decreed by God must be good. The comfort in this is that our sufferings are temporary. Even the worst chapters in human history are only temporary. Millions of years form now these events will be long behind us and their perpetrators properly punished according to God’s wrath, either on the cross or in hell. The quote of Ellen White given by the author though fails to intellectually approach these Biblical theses and themes. She basically just tells the reader to ignore obvious questions and fail to think deeply or critically regarding scripture. In doing so the reader is left with an unbiblical picture of God. The SDA god cannot be omniscient (know everything) or be omnipotent (all powerful). Instead the power must be placed in the will of man, much closer to the false theology being tossed around by Job and his friends before God rebukes them all at the end of the book. The author fails to define Job’s goodness as in faith in Christ and gives way too much power to the Devil. As I pointed out above the Devil is barely mentioned in the opening chapters and isn’t even relevant enough to be brought up at the end when God is explaining things to Job. This is evident in the fact that the author of the lesson doesn’t point out that the Devil needed God’s permission to do anything at all. God doesn’t need us to be his lawyer here for allowing the devil to assail Job. Like us, Job deserved the present and eternal punishment of God save the atoning work of Christ to save him from his sins. The author tries to couch this in mystery too but he wouldn’t have to if he applied some solid hermeneutics by appealing to other areas of scripture. In the questions at the end the author first asks us to import Ellen White’s book “The Great Controversy” into the book of Job. Specifically they want us to imagine a battle between God and Satan behind every act of evil on this earth. 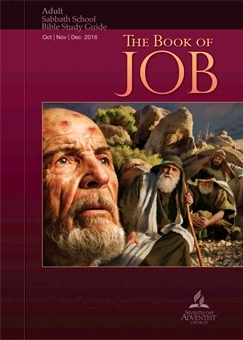 The problem is that this isn’t what is taught in the book of Job. As I pointed out above the Devil wasn’t allowed to act without God’s permission, such a battle under constraints of that nature stretches the meaning of the word a great deal. Also, as I pointed out in earlier dates I don’t think the failure to round out the beginning chapter of Job at the end is a reflection on what we are not seeing with the Devil but rather an implication on his irrelevancy. Notice at the outset she cautions against taking verbs away from God. That’s a pretty bold declaration, I didn’t realize human beings were that powerful. What kind of puny deity can be thwarted by man? The solution Ellen White presents is also placed on man, as she says we are to “believe” and “trust” and “cease to worry”. When we do this our “troubles and torment will disappear”. So effectively both the problem and the solution presented by Ellen White is man himself. If you stop doing things God doesn’t want you to do and do other things instead then everything will work out for you. To me that doesn’t look like trusting in God at all, it looks like she is telling us to trust in ourselves with a vauge sense of piety while we go about it. Copyright 2016 BibleStudiesForAdventists.com. All rights reserved. Revised November 26, 2016. This website is published by Life Assurance Ministries, Camp Verde, Arizona, USA, the publisher of Proclamation! Magazine. Contact email: BibleStudiesForAdventists@gmail.com.